DARCI BRAHMA (NZ) (Bay 2002-Stud 2007). 10 wins-4 at 2, New Zealand Two Thousand Guineas, Gr.1. Second on NZ Sire LIst 2013-14. Sire of 334 rnrs, 233 wnrs, 23 SW, inc. Recite (Manawatu Sires' Produce S., Gr.1), Nashville, Julinsky Prince, Artistic, Irish Fling, Gust of Wind, Valbuena, Darci be Good, Malandrino - Best Show (H.K. ), Super Easy, No More Tears, Windborne, Risque, Another Coup, Darci's Dream, Cauthen, Dugan, Marianne, etc. (Miss) Outshine (f. by Darci Brahma). 4 wins from 1400m to 2000m, NZ$13,375, A$76,675, 2d CJC Canterbury Belle S., L, Cranbourne TC Inglis Pinker Pinker P., 3d MRC Smart Track Australia H.
Rocbolt (g. by Darci Brahma). 4 wins. See below. Pemberley (g. by Darci Brahma). Winner at 1500m in 2014-15, 2d Ballarat TC City of Ballarat H.
UPSTAGED (In the Wings). 3 wins. See above. Balmoral Baby. 3 wins at 1350m, 1600m in 2014-15, Ipswich TC Sirromet 5 Star Winery H.
Roger Ramjet. 2 wins at 1200m in 2014-15 in Aust. Gently Bentley. 5 wins-1 at 2-to 1250m, A$153,095, STC Macquarie Underwriting 2YO H., Rosehill Gardens Event Centre H., TRC George Self Property H., Paul & Elizabeth Geard H., Tasmanian Hospitality Association H., 2d TRC Lanesborough Room H., TTC Examiner Newspaper Fashions on the Field H., AJC Cadbury Schweppes H., Dover Heights H., STC Become a Member H., 3d AJC Wilson Asset Management H., Broker's Tip H., Inglis Classic Sale February H., UD Trucks H.
TORAH (Spinning World). Winner at 1600m, A$114,400, MVRC Alexandra S., L, 2d VRC Gibson Carmichael S., L.
YOUHADYOURWARNING (Warning). 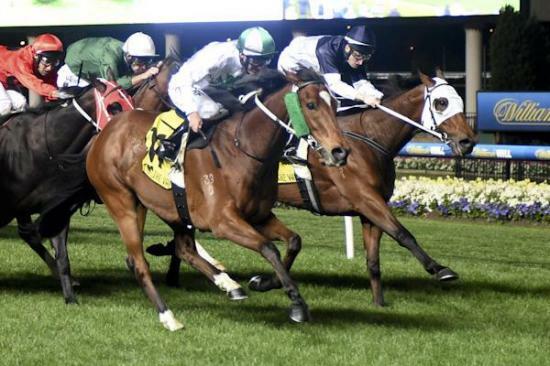 7 wins from 1400m to 2400m, £4,307, 27,000fr., A$251,030 in GB and Aust, AJC Wiggle H., L, 2d STC Kingston Town S., Gr.3. Producer. DR MORE (Danehill). 7 wins-1 at 2-from 1200m to 2000m, HK$13,545,415, HKJC Centenary Vase, HK-3, 2d Hong Kong Gold Cup, HK-1. BID SPOTTER (Redoute's Choice). 9 wins from 1500m to 2400m, A$599,345, TRC Hobart Cup, Gr.3, ATC Manion Cup, L, City Tattersalls Club Cup, L, 2d STC Frank Underwood Cup, L.
JOLIE BLONDE (Testa Rossa). 4 wins at 1200m, 1250m, A$154,238, MRC (Mornington) Hareeba S., L, Orbit Fitness H.
MAHUTA (Flying Spur). 3 wins from 1400m to 1600m, A$211,460, in 2015-16, VRC Carbine Club S., Gr.3, MRC Gothic S., L.
GRAND ARCH (Arch). 7 wins from 1m to 9f, US$1,807,331, to 2015, Keeneland Turf Mile S., Gr.1, Saratoga Fourstardave H., Gr.2, Woodbine King Edward S., Gr.2, Keeneland Allowance-twice, 2d Keeneland Turf Mile S., Gr.1, Saratoga Fourstardave H., Gr.2, Woodbine Labeeb S., L, 3d Keeneland Breeders' Cup Mile, Gr.1, Woodbine Nijinsky S., Gr.2, Sky Classic S., Gr.2, Churchill Downs River City H., Gr.3. CARTIER OPERA (Zilzal). 5 wins-3 at 2-from 1600m to 3900m in GB and France, Saint-Cloud Prix Maurice Caillault, L, Longchamp Prix du Liban Francophone. Race Record: 19 Starts 4-2-1 A$85,600. 4 wins from 1500m to 2050m, A$85,600, to 2015-16, MVRC Mayoral Charity Community H., SCTC Coastline BMW H., 2d GCTC Direct Connect H., 3d BRC Sky Racing P.